Helpful camping and reservations tips and tricks! 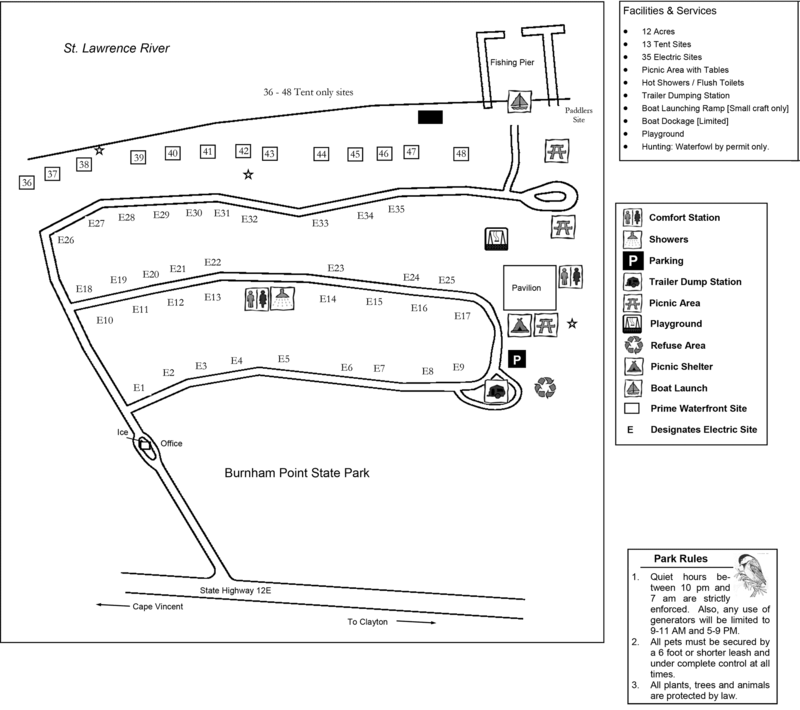 Burnham Point State Park is small and quiet with lightly-wooded campsites, ideal for boating, fishing and relaxing. Boaters can explore local towns, islands and historic sites for miles up and down the scenic river. Popular game fish include bass, pike, muskellunge and walleye. In addition to tent and trailer campsites, the park has boat docks, a playground and picnic areas. Please Note! Burnham Point State Park is currently a work in progress. Photos are currently being loaded and coded into our database at this time. Site details may temporarily show incorrect info (non-reservable vs reserveable, tent vs trailer specific, site size, electric), so please do not rely on this information until the campground is completed! 3 out of 5 lakeside stars. Offers a fine lake view camping experience with sites close, or directly by the water. 11 campsites are by the water, although they don't have easy water access. Dozens of sites have at least a water view. Located on a large body of water for enjoying water activities including paddling, boating and fishing. Note! The Weather frame below is for the Weather Underground site. This frame is provided for your convenience only. You might wish to open a separate window/tab instead to view Burnham Point weather in more detail. Note! The Weather frame above is for the Weather Underground site. This frame is provided for your convenience only. You might wish to open a separate window/tab instead to view Burnham Point weather in more detail. Note these comments are NOT particular to a specific campsite at Burnham Point ! Photos © Copyright 2003-2019. Dave McGrath. All Rights Reserved. Powered by Parkware Campground Manager. More advanced searching will available in the future!